Summer is approaching fast, which means keeping your child well-hydrated so they can avoid the dangers of getting dehydrated. Children are naturally active and that’s why its important to monitor their behavior when its hot out. Staying well educated and understanding the symptoms of dehydration will help to prevent a potentially dangerous situation from occurring. It’s important to assess any situation throughly and by knowing the facts, this will help to know how to treat your child. During a typical day, every one of us loses body water at some point during the day, especially children. Whether its from sweating profusely, crying our eyes out, using the restroom, or even when we breathe, water leaves as vapor. Most of us reclaim the water that is lost by drinking liquids and eating during the day. If your child has exerted themselves, causing them to sweat during a hot day, watch for signs. Also, if your child acquires a fever, is vomiting or has diarrhea, these could all be possible signs. The best way to avoid dehydration is to make sure your child is drinking enough liquids throughout the day, and especially if they’ve been active or sick. 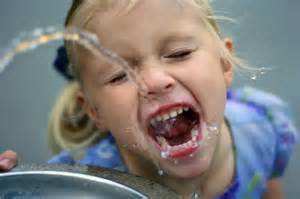 Remember, thirst isn’t a sign that your child is dehydrated. If your child is mentioning they are thirsty more than usual, there’s a good chance they’ve been dehydrated for a couple days. This is why it’s important to get hydrated before the initial need for thirst develops, and should continue to drink after their thirst is quenched. Parents should recognize the early signs of dehydration, and respond quick. When treating dehydration, the goal is to simply replace what will restore the body back to it’s regular levels. If a child has been thirsty, let them drink as much as they want and as often as they want. If a child has been involved in activities outside, sports drinks with electrolytes are good.